7:30 a.m. – As the rays of the early morning sun start to peak through the thick mist that has settled over the University of South Dakota, a lone white car sits outside of Slagle Hall under a sign that reads “Parking for University President Only.” It’s a new week at South Dakota’s flagship university and President James William Abbott has already started his day before some offices even open. The 68-year-old president, dressed in khaki pants, a white button-up shirt with the initials “JWA” embroidered on the pocket and a blue and pink striped tie sits at his desk, a Wall Street Journal newspaper in front of him and a pair of scissors in his hand. “I thought it was interesting so I’m going to send it to the Board (of Regents) executive director and ask him to disseminate (it),” Abbott says as he cuts out an article about student loans. Abbott says his usual morning routine is to wake up early and have a small breakfast and then respond to emails. He’ll then catch up on work and check USD’s website for any events that he might be interested in attending that aren’t already on his schedule. This morning he’s had a banana and is sipping from what he calls an “old man’s latte” — a large skinny latte with no flavor and one shot of espresso. He’s been up since 4 a.m., an occurrence that isn’t that rare. “I get up early because I wake up, not because I want to. I guess I just don’t need very much sleep,” he explains. The time for his first meeting of the day is drawing near and he asks Laura McNaughton, the executive assistant to the president, what’s on the agenda for his executive committee meeting. McNaughton, a USD alumna, has scheduled Abbott’s busy days for the last five years. Before that she scheduled Democratic South Dakota Congresswoman Stephanie Herseth Sandlin until her defeat at the hands of Republican Kristi Noem in 2010. She said one of Abbott quirks is that he sings little songs throughout the day, songs even he admits he has no idea how he knows or has heard. 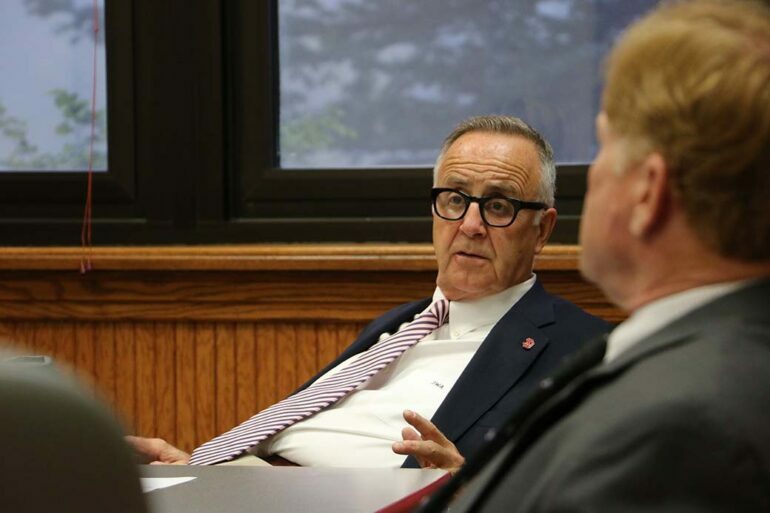 8 a.m. – Abbott sits at the head of the table, listening intently and tapping his fingers on the armrests of his chair while his vice presidents give their reports on various issues ranging from new Board of Regents policies to USD international recruiting efforts. Every once in awhile Abbott interjects with a question or a suggestion, but for the most part he listens and observes. One of the officials at the meeting, Kim Grieve, the dean of students and vice president of student services, says she and Abbott have a good working relationship. “I think President Abbott is more open minded. Certainly he wants us all to have goals, he wants us to benchmark our goals, he wants us to be having a big vision for the university, but he’s very open to what those goals are and how we move forward,” she says after she packs her bag to leave the meeting. One of the things that she says stands out the most about Abbott is his concern for students. At the meeting, Abbott asked about the welfare of students over Dakota Days, if any students were sent to the hospital with alcohol poisoning and if the ones that did were OK.
“I think the thing that I just value so much about him is that he is so concerned about students, student success and the student experience, as well as faculty, staff, the grounds, the university — he just has such pride in the University of South Dakota,” Grieve says. Executive Committee meetings are a lot different today than what they were when Abbott first took office. In fact, they didn’t even exist before he became president. 9 a.m. – After the meeting Abbott returns to his office to do paperwork and look at grievances and issues that he must attend to. On the walls of his office hangs his undergraduate degree from USD — he’s the only USD president to ever be an alumnus of the university. 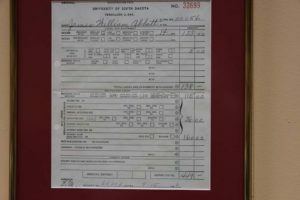 He still has a tuition bill for one of his semesters of college hanging on the same wall, a bill for $449 in the fall of 1966. It’s at USD that he majored in political science while living in Julian Hall, an old building where one wing is abandoned — something he would like to see torn down before he leaves. After graduation he became a social studies teacher at a school in Jackson, Minnesota where he taught high school and eighth grade students. After saving his money, he returned to USD to attend law school, something he always knew he wanted to do. “I think I watched too many Perry Mason reruns,” he jokes. It was in law school that he met his first wife, a woman he would be married to for eight years before a divorce — something he said didn’t affect their ability to remain friends. It wasn’t until after he had practiced law for a few years in Yankton and then became the CEO and manager of a cable company that he met the future USD First Lady, Colette Abbott, a single mother of two, at Riverboat Days in Yankton. They married six months later, on March 14, 1987. Abbott was 39 and would adopt Colette’s two daughters Sara and Lyndsey as his own. One year later, they would have another daughter, Nancy. “I would have got married in two weeks. I know that sounds nuts, but I knew right away,” he said. The two would be married for 29 years, until her sudden death from cancer at the age of 59 earlier this year. 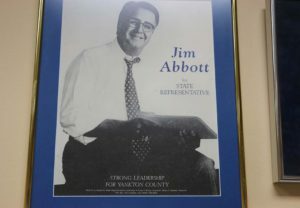 During those 29 years together, Abbott served as a city commissioner and then as a state representative in the South Dakota State Legislature from 1991-1993. He also ran and lost in multiple elections, including a bid for Lieutenant Governor in 1994, an unsuccessful run for the Democratic nomination for U.S. House of Representatives in 1996 and finally a gubernatorial run in 2002 — an election that he took an unpaid leave of absence from his role as USD’s president for. He said a gubernatorial run had always been on his mind, even back when he was an undergraduate political science student at USD. “I think that I always thought that I would be candidate for political office someday,” he said. Colette, though, wasn’t happy to be thrust into the public eye. Even though she wasn’t particularly thrilled about it, she still supported him 100 percent, Abbott said, and campaigned vigorously for him, even giving speeches on the campaign trail. He said that time, however, has passed and he no longer thinks about seeking elected office. Abbott said he’s actually thankful in ways for the fact that he wasn’t elected, since he believes there’s chance he’s accomplished more as a university president than he could have ever accomplished as governor. 12 p.m. – Abbott strolls across campus with Jim Moran, the provost and vice president for academic affairs at USD, talking about how USD can attract more students from the Sioux Falls area. On their way to the MUC to grab lunch, Abbott takes time to say hello to almost every student he comes across, including a Charlie Cart full of potential students on a tour of campus. Once inside the Commons, Abbott goes through the lunch line, grabbing a hot dog, a piece of chicken and green beans. As he talks to Moran about various issues relating to enrollment, he takes a moment to go back to the line to get a salad. He’s trying to cut out sugar from his diet and eat healthier. On his way back to his office, he greets more students. He says he loves interacting and talking with them. It was actually a student that planted the seed in Abbott’s mind to apply to be president of the university all those years ago. Abbott and Colette were sitting outside of Emma’s, a restaurant that would eventually become Raziel’s and will soon become the new Brick House restaurant, when Brendan Johnson, the student body president and future United States Attorney for the District of South Dakota, suggested he apply to be USD’s new president. Less than a year later he would become the university’s 17th president. Since coming into office Abbott has overseen the construction of Coyote Village, the Wellness Center, the Coyote Sanford Sports Center and the renovation of a multitude of other buildings and the implementation of numerous programs. He said he still has things he would like to accomplish before he retires, though. He would like to see some buildings, such as Julian Hall and Noteboom Hall torn down, while also seeing the construction of a new health sciences building and the awarding of special accreditations to as many programs as possible. “I suspect I’ll always have something I’d like to have done,” he said. Abbott said that despite rumors, he’s not planning on retiring or making a decision on retiring until the spring, one year after Colette’s death. “Look, I’m 68-years-old and I’m going to be 69 at my next birthday so I think it would be surprising if there weren’t rumors that I was going to retire sometime soon. Indeed, it’s possible it’s just wishful thinking on some people’s parts. I hope not, but it’s possible,” he says chuckling. 5 p.m. – With his last meeting of the day over with, Abbott walks back across campus from the MUC to his office. As the changing autumn leaves fall from the trees he admires the spacious campus. A consultant had once suggested that USD should build more buildings in order to become a more “urban” campus — something Abbott still scoffs at. When asked whether or not he feels a sense of ownership of USD, he remarks that while he does, he can’t take all of the credit for all of the improvements that have happened on campus in the last 20 years. Each project had numerous people pouring time and resources into it. “I feel a little bit of ownership, but mostly immense pride in the university,” he says. He gathers some things to work on at home, including a batch of thank you cards to hand write to well-wishers who sent him flowers after his mother died on Dakota Day less than two weeks ago. He can’t decide whether or not he wants to go home and take a nap or take his six-year old labradoodle McGovern for a walk. He tells Laura that he might not be into work in the morning since he’s not feeling well and thinks he might be coming down with a cold. Before he steps out the door, though, he speaks with her about the more than 700 full-sized candy bars he’s ordering so he can hand them out this Halloween. He wants to make sure they’ll arrive in time. Then, with a “have a good night,” he walks down the hall and out of the building to his car where he gets in and drives away. It’s another day completed at the place he’s loved for more than 20 years.